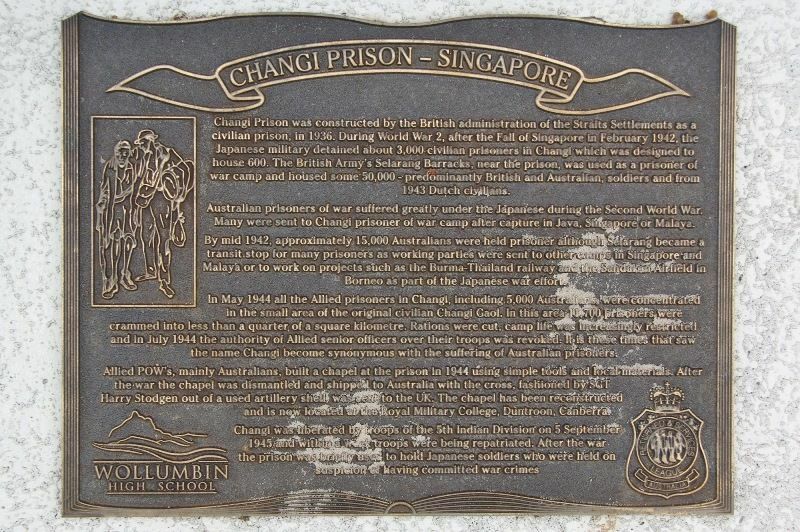 A plaque commemorates those who were prisoners of war in Changi during World War Two. During World War II, following the Fall of Singapore in February 1942, the Japanese military detained about 3,000 civilians in Changi Prison, which was built to house only 600 prisoners. The Japanese used the British Army's Selarang Barracks, near the prison, as a prisoner of war camp, holding some 50,000 Allied soldiers, predominantly British and Australian; and from 1943, Dutch civilians brought over by the Japanese from the islands in the Dutch East Indies (now Indonesia). POWs were in fact rarely, if ever, held in the civilian prison. Nevertheless, in the UK, Australia, The Netherlands and elsewhere, the name "Changi" became synonymous with the infamous POW camp nearby. About 850 POWs died during their internment in Changi during the Japanese occupation of Singapore, a relatively low rate compared to the overall death rate for POWs in Japanese camps. However, many more prisoners died after being transferred from Changi to various labour camps outside Singapore, including the Burma Railway and the Sandakan airfield. Allied POWs, mainly Australians, built a chapel at the prison in 1944 using simple tools and found materials. Changi prison was constructed by the British administration of the Straits Settlements as a civilian prison, in 1936. During World War 2, after the Fall of Singapore in February 1942, the Japanese military detained about 3,000 civilian prisoners in Changi which was designed to house 600. The British Army`s Selarang Barracks, near the prison, was used as a prisoner of war camp and housed some 50,000 - predominately British and Australian, soldiers and from Dutch civilians. Australian prisoners of war suffered greatly under the Japanese during the Second World War. Many were sent to Changi prisoner of war camp after capture in Java, Singapore or Malaya. By mid 1942, approximately 15,000 Australians were held prisoner although Selarang became a transit stop for many prisoners as working parties were sent to other camps in Singapore and Malaya or to work on projects such as Burma-Thailand railway and the Sandakan Airfield in Borneo as part of the Japanese war effort. In May 1944 all the Allied prisoners in Changi, including 5,000 Australians were concentrated in the small area of the original civilian Changi Gaol. In this area 11,700 prisoners were crammed into less than a quarter of a square kilometre. Rations were cut, camp life was increasingly restricted and in July 1944 the authority of Allied senior officers over their troops was revoked. It is these times that saw the name Changi become synonymous with the suffering of Australian prisoners. Allied POW`s, mainly Australians, built a chapel at the prison in 1944 using simple tools and local materials. After the war the chapel was dismantled and shipped to Australia with the cross, fashioned by SGT Harry Stodgen out of a used artillery shell, was sent to the UK. The chapel has been reconstructed and is now located at the Royal Military College, Duntroon, Canberra. Changi was liberated by troops of the 5th Indian Division on 5 September 1945 and within a week troops were being repatriated. After the war the prison was briefly used to hold Japanese soldiers who were held on suspicion of having committed war crimes.